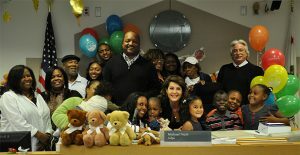 Witnessing the happy faces of the children whose adoptions we finalize is the foundation of what we do. But it isn’t the start or end of our advocacy for children and their families. Many of the faces we see at Adoption Day are sweet faces we’ve seen before. Rosie, top left, came to us through our Medical-Legal Partnership at L.A. County + USC Medical Center. This is also where we met Sophia (top right in stripes). In both cases, our benefits program ensured sufficient resources were provided to each of the families so they can provide for the girls’ unique medical and educational needs. School success is among the Alliance’s top priorities because education leads to a better life, and academic stability can result in A+ behavior at home, keeping kids with loving families. Earlier this year, we watched three siblings join the Lopez family, bottom right, but not before our education team helped the family secure therapies and services to get the three, four and six year old ready for kindergarten. The greatest story of all is a teenager finding a forever family. We met Anthony, bottom right, when he was in junior high, before an adoptive family had even been found for him. For four years, we successfully fought for classroom support and resource assistance for Anthony. Our work gave him what he needed to thrive in school. This progress was only outdone by a compassionate young family Anthony was placed with in 2012. This February, we were at the 17-year-olds adoption and got to see the life changing impact of family and advocacy. The benefits of a holistic approach are visible in our clients. When our programs and the communities work together to meet a child’s needs, we ensure they have safer and brighter futures. This entry was posted in Benefits, Foster Care Adoption, Healthcare and tagged foster care adoption, L.A. County + USC Medical Center, Medical-Legal Partnership. Bookmark the permalink.